Yowza. 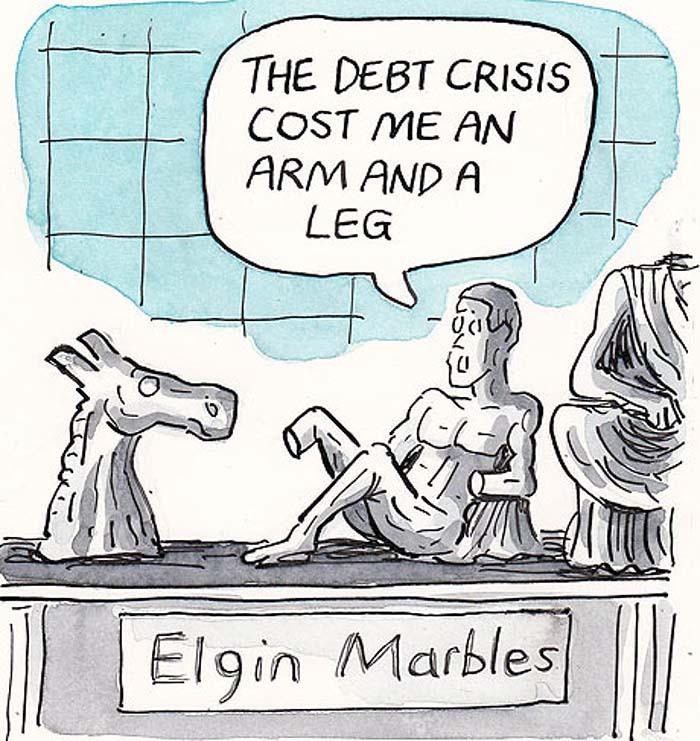 Just in the last week, I’ve seen countless articles on how the Greek debt crisis is impacting the Greek wine trade. They are all a good read and provide a lot of information about the current state of affairs. You don’t want to read them all, you say? Well, never fear! I have taken the liberty to read them and provide you a neat-and-tidy-little-bullet-pointed summary. You’re welcome! Wine is the dominate alcoholic beverage of choice among Greeks. It is the only alcoholic beverage that has remained free of excise tax. Taxes on spirits and beer have increased. Consumption of spirits has declined 20%. Winery owners should expect the best fruit from their growers as they will not want to jeopardize their relationships and business. With sky-high unemployment, there should not be a problem finding pickers for harvest. Winery owners are concerned about procuring supplies such as bottles, corks and barrels, especially with the harvest coming up. Suppliers are either currently not doing business in Greece or requiring upfront payment. Some of the bigger wineries with steady relationships have been able to manage some short term leniency but smaller wineries not so much. Some wineries are even asking their importers to withhold payment on outstanding invoices for fear of their deposits getting seized. This is likely temporary, otherwise how can they survive! In the domestic market, consumers are trading down. In restaurants, bottle sales have decreased as more Greeks shift to wines by the glass or ‘hima’ wine. Restaurant business has been hit hard even before this year. In 2013, 4000+ restaurants shuttered while 93% of Greeks surveyed said they have substantially reduced eating out. This was due in large part to the restaurant tax increase to 23% during that year. This tax was reduced in 2013 but the damage had already been done. The future of EU subsidies are unknown. In the past, Greek wineries were recipients of generous subsidies from the EU for the purpose of construction, vineyard replanting, equipment purchases, promotion, etc. These subsidies averaged 50% of the overall cost and were instrumental for growth. Over the past two years, these subsidies have decreased. Who knows what the future holds. Well, there you have it. When you look at it, you may think ‘Hey, there are the same number of good news vs bad news tidbits.’ What I like to think is that the ‘good’ outweighs the ‘bad’ but the impact of many of the ‘good’ tidbits will take a bit longer to realize and the ‘bad’ tidbits are real and current, and hopefully short-lived. We can only hope. How intriguing Lisa! Thanks for working on this. It’s very fun to learn more about your part of the world! Mmmmmm, makes me want to visit Greece and drink wine! Congratulations on creating this fantastic site! This entry was posted on July 28, 2015 by Lisa Stavropoulos in Uncategorized.